People around the world are now more dependent on foreign crops than ever before. This substantial change in production and reliance on foreign crops is partly due the fact that not all crops can be grown in the same climate, and partly due to economic incentives for developing countries to sell their products on the global market. Currently, the dependence on foreign crops is largely due to the decreased value of national currency for exporting countries, cultural supermarket norms in developed countries, and food trends that increase the intensification of monoculture cash-crops. Additionally, as the incomes of developing countries increase, so too does their ability to acquire larger and more exotic food supplies. There are also some tradeoffs associated with the globalized food system: More complex import and export connections increase food security, but also increase greenhouse gas emissions due to intensified production. An increase in greenhouse gas emissions can have adverse effects on the global agro-industry and impede the availability and production of crops that the world currently relies on. The dependence on foreign crops is growing rapidly across the globe. This drastic change in production and reliance on foreign crops that is experienced internationally is due to socio-economic and agricultural factors, that varies greatly amongst countries of the world. The ability for countries to access diverse crop resources is necessary in achieving food security, and the majority of countries in the world utilize crops that originate from outside their borders. Nations benefit from international collaboration in growing their individual plant genetic resource, which subsequently aids in national food security One of the major socio-economic drivers of increasing global food demands and the dependence on foreign crops is the global population growth. Research conducted by the UN Population Prospects suggests that the world’s population is expected to grow by 34% by 2050, an expected 2.3 billion increase in people. According to this study, almost all of the population growth is expected to occur in today’s developing countries (Figure 1). Urban expansion and rising incomes are expected to grow in junction with the population, which will bring subsequent lifestyle changes. Lifestyle changes that will ensue as a result of urbanization include changing consumption patterns, and the dietary palettes of individuals will grow and diversify around the globe. Such diversification in diets will increase the demand of crops that are native to a particular country, emphasizing the growing dependence on foreign crops. Figure 1. 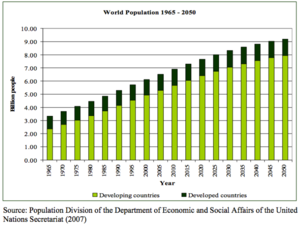 The expected population growth model from 1965 to 2050 according to a study conducted by the UN Population Prospects, showing a majority of the population growth expected to occur in developing countries. Source: Food and Agriculture Organization of the United Nations, 2009, How to Feed the World in 2050. Reproduced with permission. Moreover, the changes in agricultural practices observed over the past 50 years have increased the ability for the world to provide a greater abundance of food by increasing productivity, crop diversity, and limiting seasonal dependence. These practices have created a societal standard for non-native products to become the supermarket norm in developed countries, and is responsible for sustaining the dependence on foreign crops in order to maintain such cultural supermarket norms. For many impoverished countries, economic growth is directly or indirectly linked to the agricultural industry. Moreover, those involved in agro-industrial professions are twice as likely to reap the associated economic benefits than individuals not affiliated with the agro-industry. Therefore, economic incentives for pursuing professions in the agriculture industry are magnified, more so for individuals residing in impoverished and/or rural communities. The drive for these communities to produce and supply food for urban markets is further exacerbated by the devaluation of national currency regarding profit margins when products are sold on the global market. Despite the projected growth in urban incomes, individuals in rural areas will continue to struggle for equitable distribution of the world’s dietary resources. Regardless of the overproduction and overconsumption of dietary resources that occurs today, approximately one billion people are chronically malnourished. The persistence of hunger can be due to an absence of job opportunities for poverty-stricken individuals and the lack of social safety policies in place. Close to 75% of individuals residing in the rural communities of developing countries obtain a significant portion of their incomes from the agro-industry. If governments continue to limit the funding and political attention to rural communities, the malnourishment trends are predicted to continue to rise despite global growth in food production and urban incomes. Furthermore, the demand of popular foreign crops promotes monoculture cash-crop growth, which can overtake traditional food crops in order to support market demand. If business as usual trends continue, the lack of equitable distribution of dietary resources across the globe will be sustained, unless fair economic incentives for employees of the agro-industry are implemented. The environmental impacts of the growing dependence on foreign food crops is another important aspect to take into consideration when addressing this issue. As the world’s food supply continues to grow, we have become increasingly dependent on fewer crops, further promoting intensification of monoculture cash-crops that can have detrimental effects on the environment. By continuously cultivating lands in order to mass produce crops, soil erosion and degradation will commonly occur as a result. Soil erosion will subsequently lead to arable land being destroyed and agriculture farmers being forced to move to more productive lands, therefore continuing the vicious cycle of land degradation. Furthermore, soil erosion and degradation can lead to increased flooding as the soil’s ability to hold water decreases without the topsoil that has been removed for agricultural purposes. The inability for soil to absorb water due to soil erosion can be amplified when intense rains occur and the runoff causes flooding, and further degrades the soil. Finally, another negative impact of our dependence on foreign crops that will have long lasting effects on the agriculture system is anthropogenic driven climate change. Through elevated temperatures, increased carbon dioxide emissions, and increased natural disasters, there will be consequential changes to food production, availability, and accessibility. The impacts of climate change will be largely felt in countries in the Southern Hemisphere where a greater frequency of natural disasters such as droughts and floods will be felt and impede upon crop production. The cumulative effects of climate change will be felt across the globe and will affect global agriculture production. This will subsequently result in increased food prices. Dramatic increases in production and consumption of staple foods, such as rice and wheat, can have adverse effects on developing countries and individuals who are already suffering from poverty and malnourishment. In this section, we welcome contributions from scholars and students of other disciplines to broaden the scope of the issues presented in this case study. Through the lens of other disciplines and professions, what other costs, implications, and/or impacts become apparent with our increasing reliance on foreign crops? What special expertise, resources, or theoretical orientations might others bring to help us better conceptualize and contextualize the issues related to increasing dependance on foreign crops? Rules on intellectual property - patents regarding plant breeders rights and trademark/copyright security. Rules on intellectual property are central to struggles over distribution of wealth and power in modern day society. Demand factors - Income and population growth, biofuel expansion, declining value of the dollar. Supply factors - Slow growth in agriculture production, low investment in agro research, rising cost of energy. It is clear the poorest nations are the ones most negatively affected by the issue of food security. Higher food prices lead to income declines and an increase in political instability observed most commonly in impoverished countries. Research has also found a [strong] [correlation] between weather shocks and the probability of [floundering] government repression or civil [unrest]. Additionally, we must consider the factor of corruption within the judicial system. In order to properly address food scarcity, the governing body and their actions, or lack thereof, must be taken into account. The richest nations who hold the intellectual property rights (IPRs) to particular money crops and seeds have laws in place to address the immediate impact of intellectual property protection that financially benefits those who have knowledge and power. This consequently increases the cost of access to important crops to those without intellectual property rights. These nations with IPRs possess the arable lands to grow the foods and are the ones who reap the associated positive benefits of food security. As the prices of important crops increase, transportation costs go up. As populations of poorer nations swell, food demand increases. Therefore, there is a drastic decrease in supply, and when there is not enough accessible food it will consequently become more expensive. It is clear that with the ability to attain IPRs, those who belong to more prosperous and developed countries will benefit regardless of price fluxes in food supplies. Numerous sources regarding the growing dependence on foreign crops exhibit a clear bias which infers that if we do not find a way to solve the problem of access to proper nutrition, there will be vast issues regarding civil unrest and riots. A study conducted by Arezki and Bruckner in 2011 evaluated a food price index, with respect to political variables. Such political variable included data regarding riots, anti-government demonstrations, and measures of civil unrest. Then, observing the trends of 61 countries over a span of forty year, it was discovered that there is a direct correlation between increased food prices and the escalated probability of civil conflicts, riots, and anti-governmental demonstrations. Additional research has broadened this analysis by considering government mitigations. Research conducted by Carter and Bates in 2012 evaluated data from 30 developing countries between the years 1961 to 2001. It was concluded in this research that when governments mitigate the impact of food price shocks on urban consumers, the apparent relationship between food price shocks and civil war disappears. We must consider war and conflict as a development issue, as these events severely impact local economy. A disruption in local economy can in turn lead to forced migration and dislocation, thus causing food insecurity.It is difficult to pinpoint the exact cause of instability regarding the dependence on foreign crops, as the evidence shows that there are several contributing factors that work in junction to decrease food security and food availability. The debate continues. A promising remedial action to lessen the environmental impact of a globalized food system is the implementation of an accurate international carbon labelling standard on all food items. This will give the consumer information about the carbon footprint of the foods they are buying which will allow consumers to make informed decisions about the foods they eat . This convention will incentivize farmers, both domestic and abroad, to produce foods that are more environmentally-friendly through management practices that help to mitigate global climate change. Perhaps more importantly, an international carbon labelling standard will also give governments an impetus to create food import policies that incentivizes the import of environmentally-friendly foods. By subsidizing food items with smaller carbon footprints or taxing those with larger carbon footprints, governments will force consumers to bear the full price of the ecological damage that is done by the production of food items. Through the subsidization of sustainable food items, governments will be able to show that they are acting in accordance with international environmental agreements they may have signed.Nonetheless, in order to implement such a standard, there must be a way to empirically gauge the environmental impacts of food items. "Food miles" -- the number of miles a food item traveled from the producer to the consumer -- is a popular method of estimating the carbon emissions of a food items, and might be a viable gauge. However, the concept of “food miles” has been criticized for its poor portrayal of the actual carbon emission footprint of food. Although not always the case[Note 1], the distance a food item has travelled does not generally comprise the majority of the carbon emissions associated with supplying a consumer with that food item. Rather, the particular management practices employed in the production of that food item have a greater effect on the total carbon emissions involved in its consumption. One paper argues that in contrast to food miles, researchers ought to produce “spatially explicit life cycle assessments”, which considers the geographic, temporal, political, environmental, and economic contexts of the food items as constituting a major component of the life cycle of that food item. In doing so, researchers can achieve a more accurate understanding of where, when, and how food ought to be produced for a more sustainable food system. In a world that is experiencing a rapidly changing climate, agricultural systems face the risk of more pronounced climatic shocks and increased pest pressure. The creation of resilient agro-ecosystems which are able to bounce back from exogenous shocks more effectively may be crucial in reducing the volatility of food prices as a result of these shocks. Thus, improved research into the adoption of crop management techniques that increases resilience, such as biodiversity conservation, is an important step in creating a global food system that is less affected by climatic shocks. Further policy research also needs to be done that takes into account the increased interconnectedness of agriculture and energy with global financial markets. Such research will help create policies that are not blind to the economic effects of a globalized and complex food system  still reeling in the wake of the 2007/08 food price crisis. Investments from small-holder farmers (private sector) are sometimes dismissed because the agricultural Research and Development (R&D) sanction is predominantly controlled by the public sector (the government) To increase the investments and actions in the private sector, intellectual property rights need to be addressed to ensure balance between both sides of the sector. Furthermore, to increase investments, small-holder farmers from developing countries must be aware of the need for expertise in the field of law, international negotiations, economics, administration of intellectual property protection, and the formulation of domestic policies. This expertise is attainable for a price on the world market. Therefore, it is recommended that developing countries make investments towards the education required to make negotiations and decisions with other countries. Additionally, to trigger action in the private sector, increasing investment in technology transfer would give small-holder farmers easier access to relevant and developed technology. When equipped appropriately, small-holder farmers will be able to produce twice as much to benefit the poorer countries than larger government holders. The global population is projected to grow most significantly in underdeveloped countries. This means that the demand percentage for food and energy will continue to rise apace with the population increase. At the current level of technology, the availability and price for food and feed will become a more prominent issue with regards to the increase in demand for biofuels. As the global population increases and there is a greater demand for food, there will be a simultaneous increase in energy demand and prices, which will put greater pressure on the preference for biofuel. The sudden rise in energy prices is due to the increase in prices of crude oil which is now provoking investors to slowly start make the transition to more food-based biofuels. As the demand for food-based biofuels increases, competition will increase between biofuel production, other energy production, and the food market. This will in turn cause the food prices to rise quite substantially. If there is no advancement in technology the amount of jobs will remain relatively constant. This will subsequently cause incomes to remain the same, thus creating more hunger and poverty. Therefore, the need to create policies towards 3rd world countries that target poverty and population growth issues will need to be renegotiated. Additionally, the policies that promote the use of food-based biofuels will need to be reconsidered with the objective to reduce competition between food and fuel for scarce resources. Currently, the slow percentage increase in agricultural Research and Development (R&D) will not be sufficient to keep the supply on par with demand whatsoever. The slow growth in agriculture production is due to the lack of investments needed for agricultural Research and Development (R&D). Therefore, the majority of future investments for agricultural R&D need to be directed towards countries that are experiencing scarce opportunities to develop their agriculture sectors. It is essential that the investments do not only come from large stakeholders such as the public sector, but also from small stakeholders in order to limit any corruption that may occur and diversify the agro-industrial decisions made. To give small-stake holders confidence to enter the market, IPRs cannot be blocking as much market space as they are. Moreover, small-holder farmers need to acquire the proper technology in order to take advantage of the arable lands that they own. With respect to food supply, it is important to consider the large dependency on crop yields and cropping intensity required to fulfill the 80% necessary increase of food production by 2050. Currently, crop yields have been increasing at a linear rate (globally), but this is certainly not enough to sustain the world's growing population. There is an urgent need for larger investments into the research of technology advancement towards agriculture. In regards to mitigation strategies for unpredicted weather, production short falls and decreasing stock levels, steering towards the direction of a fair and competitive global trading system would be a valuable choice for the world. Countries need to reform the rules of trade and consider creating joint measures to prepare for future shocks to the global system. By decreasing and taking away export restrictions from countries it would reflectively make the food market more dependable and additionally aid in the prevalent issues listed above. Countries would be able to ask for help when needed, and other countries would be prepared to help if need be. By easing export restrictions, the price and access of food globally would be more attainable and thus slowing down the growth of demand. The growing dietary dependence on foreign crops observed throughout the world is driven by various socio-economic and agricultural factors: growing urban incomes, devalued national currency of developing countries, and desirable crops originating from particular geospatial regions of the world. Although this globalized food system is able to deliver exotic food goods to the world population, there are also negative impacts of this globalized food system, including exacerbation of inequality, ecologically-harmful monoculture cropping, soil erosion, deforestation. The ramifications will be significant if there continues to be an ongoing disregard for the economic impacts experienced by rural communities in developing countries, the environmental consequences of unsustainable agriculture practices, and the effects of anthropogenic driven climate change. It is imperative that national governments work together to mitigate the issues surrounding the world’s necessary interdependence of foreign crops. Government intervention is necessary in order to reduce subsidies for the poor and help keep food affordable and accessible for everyone. Interventions may include signing national agreements and/or conventions with agro-industries, ensuring that consumers have the right to access affordable food choices despite geographic location.Furthermore, understanding that accessibility to food is a basic human right, and withholding safe and innovative technologies for more efficient agricultural practices is morally unacceptable. Therefore, it is the moral imperative of developed countries to invest in the livelihoods of people in impoverished countries and rural communities, with respect to modern agricultural technology and protecting natural resources. Another method of mitigating the issues connected to the global dependence on foreign crops is investing in more sustainable agricultural practices for use in North America or abroad. In order to stem the growth of the dependence on foreign crops, developed countries could learn to produce local varieties and import less foreign crops. This will help to safeguard the world’s natural ecosystems and lower the economic incentive many foreign countries feel for producing larger quantities of food for the global market, thereby making it easier for all nations to have self-sufficient agricultural systems. Through these actions, global food security can be achieved while working towards a more sustainable environment for future generations. ↑ Headey, D. and S. Fan. (2010) Reflections on the global food crisis: How did it happen? How has it hurt? And how can we prevent the next one? IFPRI Research Monograph 165. Washington, DC: International Food Policy Research Institute. ↑ 10.010.110.2 Piesse, J. and C. Thirtle. 2009. Three bubbles and a panic: An explanatory review of recent food commodity price events. Food Policy 342: 119–29. ↑ Dell, M., B. Jones, and B. Olken. 2008. Climate change and economic growth: Evidence from the last half century. NBER Working Paper Series, 14312. ↑ Besley, T. and T. Persson. 2009. Repression or civil war? American Economic Review 99: 292–97. ↑ 26.026.1 Simmons, J. (2011). Making safe, affordable and abundant food a global reality. Elanco Animal Health. Retrieved April 6, 2017, from https://www.ncbiotech.org/sites/default/files/pages/Three-Rights-White-Paper-Revised.pdf.